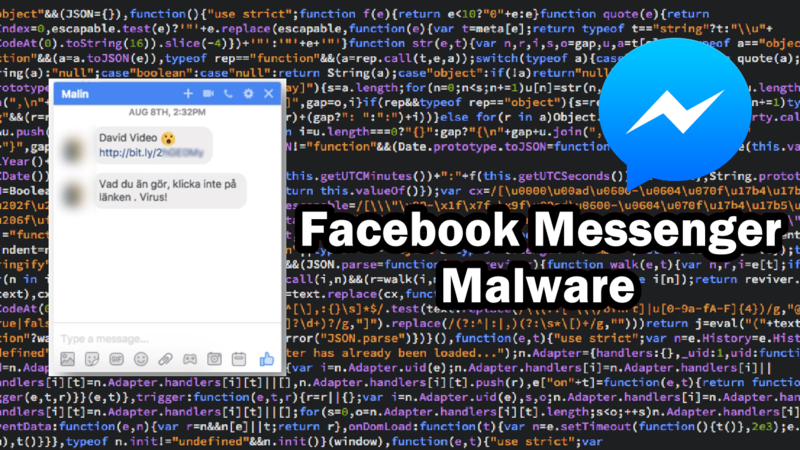 Beware Facebook Messenger users, as cybercriminals are targeting victims by spreading malware through links sent by their friends. The malware campaign was discovered by David Jacoby, a senior security researcher in the global research and analysis team at Kaspersky Lab, who was himself targeted after a Facebook friend with whom he rarely interacts, sent a link to a purported video file in Messenger. “After just a few minutes analyzing the message, I understood that I was just peeking at the top of this iceberg. This malware was spreading via Facebook Messenger, serving multi platform malware/adware, using tons of domains to prevent tracking, and earning clicks,” David said. So, how does this malware spread? Apparently, the malicious message containing a bit.ly or t.cn link and the name of the user plus the word “Video” arrives through one of your friends account on Messenger to make the potential victims believe that it is a legitimate video link. When the victim clicks on the link, it will take the user to a Google Docs page that has a screenshot photo of that Facebook friend. The message is made to look like a playable movie. But when clicked on that video, the victim is redirected to external sites depending on their browser, location and operating system that ultimately attempt to lure them into installing the malware. This malicious software, if downloaded, will cause the victim to spread the virus to their contacts on Facebook Messenger. “By doing this, it basically moves your browser through a set of websites and, using tracking cookies, monitors your activity, displays certain ads for you and even, in some cases, social engineers you to click on links,” Jacoby writes. For example, a Google Chrome user is redirected to a fake YouTube page with a fake error message designed to push the user in downloading a malicious Chrome extension. Meanwhile, on Firefox, the users get directed to a website displaying a fake Flash Update notice, which attempts to run a Windows executable to deliver the adware. Since this malware is cross-platform, it affects MacOS Safari too and offers the download of a .dmg file, which is also adware. It is unclear how the malware spreads via Messenger. “The initial spreading mechanism seems to be Facebook Messenger, but how it actually spreads via Messenger is still unknown. It may be from stolen credentials, hijacked browsers or clickjacking,” David speculated. “The people behind this are most likely making a lot of money in ads and getting access to a lot of Facebook accounts,” said David. “We know that clicking on unknown links is not recommended, but through this technique they basically force you to do so. “Please make sure that you don’t click on these links, and please update your antivirus!,” added David. When ZDNet got in touch with Facebook regarding the matter, a spokesperson for the social media giant said: “We maintain a number of automated systems to help stop harmful links and files from appearing on Facebook. 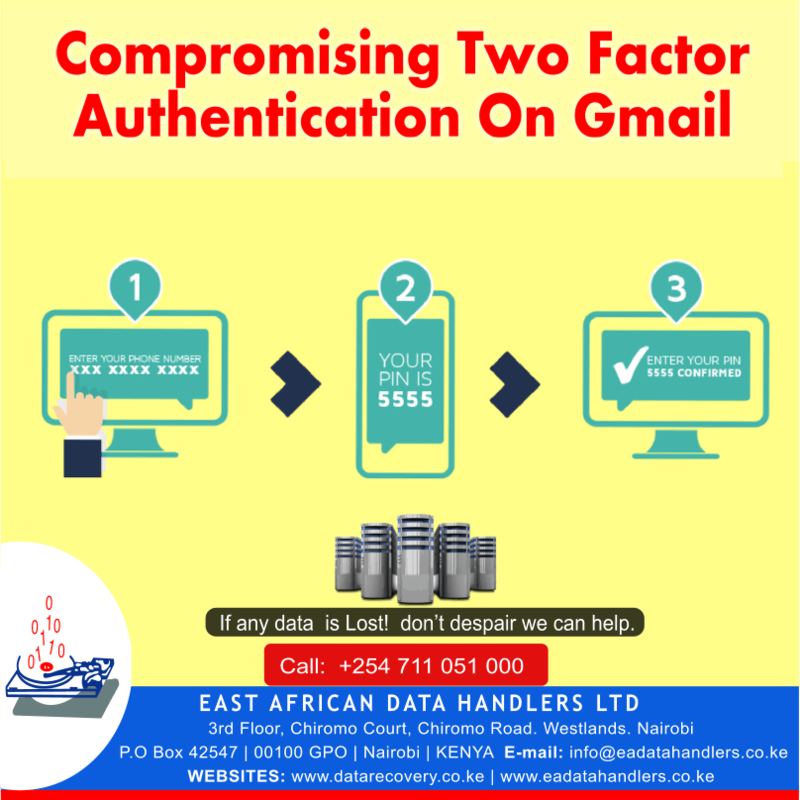 Two factor authentication just like many other security controls is perceived as a good security control. Many companies establish these controls within their organizations and at the same time hackers who wish to access company data are constantly trying to find ways to beat these controls. Sometimes they fail to find ways through these control so they decide to “hack the employees” this is basically termed as social engineering. This info graphic shows how a human resource manager was tricked into letting the hacker log into his Gmail. In the Kenya Cyber Security Report 2016, one of the cyber security Gaps in Kenya is employee training, many companies install great security controls but don’t give any sort of training to the employees who consequently expose the companies to hackers. If you’ve lost valuable, irreplaceable mobile data or need Data Recovery Plan for your Oraganisation or business— We can save it! Call us now at +254 711 051 000 or visit our offices Chiromo Court 3rd Floor Westlands, Kenya. Best of it, we have distributed offices all over East Africa and can easily get your device brought to us from anywhere in East Africa. Should you leave your smartphone plugged into the charger overnight? It’s an issue that has plagued humanity since the dawn of the mobile phone. We use our trusty pocket computers so much that they rarely get through a day with any power left. Many of us plug them in at night and fall asleep, content in the knowledge that we’ll wake up to a fully charged device. But is it really safe to leave our phones plugged into the charger once they’re fully charged? 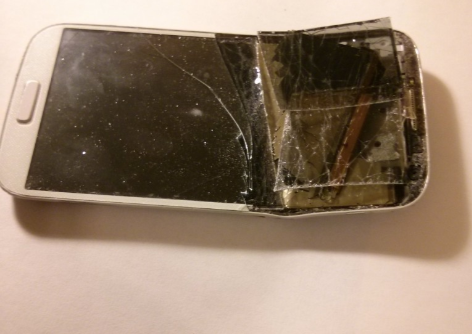 Is it damaging the battery — or shortening its lifespan? There are lots of myths and questionable ideas on this topic. You’ll find the Internet awash with opinions masquerading as facts. What’s the truth? We’ve got some answers for you. Should you leave your phone plugged into the charger overnight? Eventually the battery is going to noticeably degrade. So far so good, but there are situations when leaving that smartphone plugged in overnight can slowly reduce the lifespan of your battery. Make sure you take your phone case off at night if you’re going to leave your phone plugged in and charging, in other words. What’s the optimum way to charge your phone? So frequent top-ups, rather than one daily charge up, is healthier for your battery. It’s not convenient, but that’s the optimal way to charge your smartphone if you want to ensure the longest life possible. You may have a high number of charge cycles before that limit is reached, but eventually the battery is going to noticeably degrade. When it does, you’ll find that it lasts only a very short amount of time, or it will simply not turn on at all. 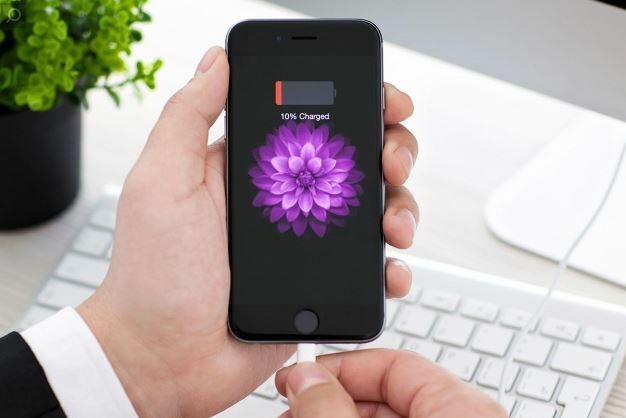 “Try to avoid going from 0 to 100 percent whenever possible, this will start to break down your battery and give your device a shorter lifespan.” Shane suggests. There’s one other factor to consider when charging your smartphone and it concerns the quality of the accessories you use. It’s always best to use the charger and cable that shipped with your smartphone. Failing that, you can buy another official charger and cable. Cheap counterfeits are not built with safety in mind and can be very dangerous. Sometimes official chargers and cables are eye-wateringly expensive. But you can find reputable alternatives. Manufacturers like Farbe Technik produce safe accessories that are fully tested, certified by the likes of Apple and Samsung, and compliant with legislation. If you are going to buy a charger from a third-party just make sure to stick to big brand names. It’s also important to ensure that the charger and cable you buy has the correct rating. Cross-check the amp or watt rating with your phone’s specifications. The real risks are found at the cheap end of the market. Cheap counterfeits are not built with safety in mind and can be very dangerous. They often don’t meet safety standards. The London Fire Brigade released a report last year warning about the dangers of electrocution, burns, and even house fires after a number of incidents caused by counterfeit iPhone chargers. The report also offers some advice on how to spot fakes. Always use official chargers and cables, or certified alternatives from reputable brands and retailers. Don’t let your phone get too hot. Remove the case when charging overnight. For the longest battery life possible, try to keep your battery between 50 and 80 percent. 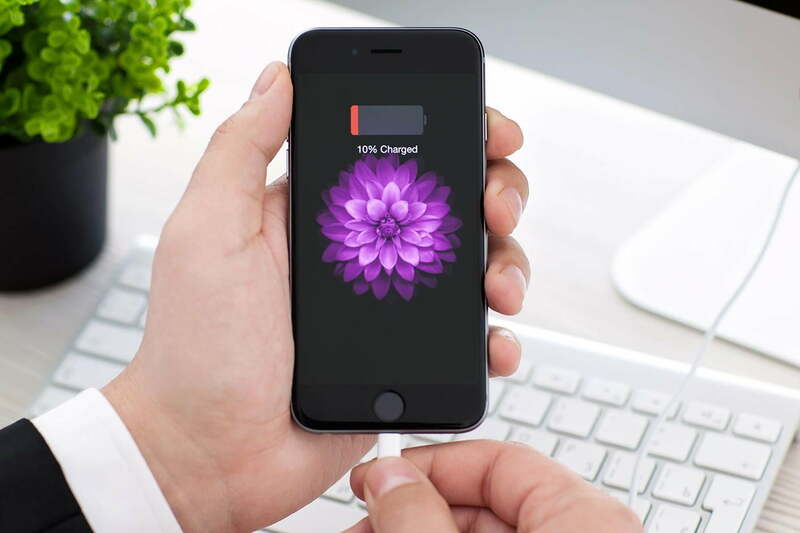 Avoid letting phone battery completely discharge, and don’t charge it from 0 percent up to 100 percent too often. Android smart phone is one of the most marvelous handheld devices on the planet. It takes pictures, surfs the net and keeps you in touch with all your friends and acquaintances. But, what happens if your marvelous wonder machine loses all your data? Phone numbers that no one bothers to remember anymore or the pictures you just tool of your child’s first steps. It can all be gone in an instant and today we will talk about top 5 causes of Android data loss how you can lost everything. es to the latest Android OS version. Unfortunately, in a number of instances all the personal information is erased after the OS update. This means you have to re-enter everything by hand all over again. This can take many hours and often you will not be able to put it all back as most don’t keep their contacts and phone lists up to date in hard copy. You can lose your Android device through a number of mishaps such as dropping it into a lake, river or pond. It could be stolen or it just may fall out of your pocket at the train station, bus stop and checkout counter at your local supermarket. Sorry to say most data is lost by accident when someone deletes it by mistake. You mean to delete one item and you chose the wrong one in error. Now you are missing a vital phone number or a special picture that is very precious to you and your memories. This is probably the most common occurrence that cases Android data loss. Some attempt to get more out of their Android and they go to see their local Android teachs. These individuals can unlock features that you might never have been aware of before you visit them. However, one of the side effects is that all your data can vanish as a result. Believe it or not, a simple thing such as replacing your battery can cause your Android phone to lose all of your personal information and you have to start all over again as in some instances it resets the Android back to its original factory settings. Then, what if you lose important data from your Android phone? 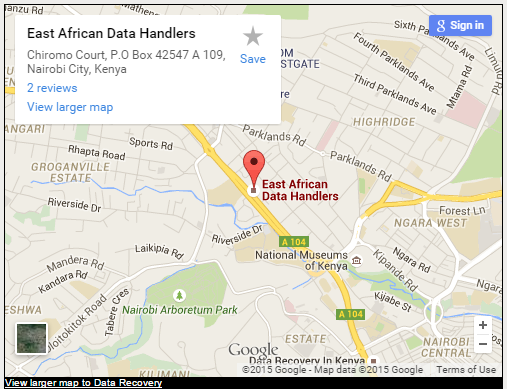 East African Data Handlers are capable of recovering your lost data no matter how you lost it. Our available technology is able to solve the Android data recovery problem as easy as pie. We will assist you to recover not only photos and videos, but also text messages and contacts from Android phone or tablet. We use our Android data recovery technology directly to recover lost files from Android device, or even can also restore formatted or deleted data from the SD card on your Android mobile. No matter how your Android data was lost or deleted, our technology can scan and recover them for you without any hassle. 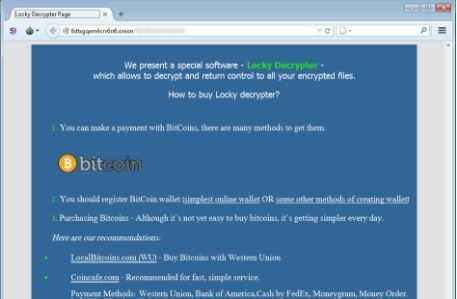 Remember that preventing Locky and extortion-ware like it is simply a matter of user discipline and an awareness of how malware can be contracted. The first consideration for stopping infections is to maintain an up-to-date system. This includes operating system security patches and ensuring that you’re using the latest version of your browser; place browser settings to their highest that still allow access required and warn of hazardous ‘site content. Disallow all add-ons, plugins and extensions. Install a good firewall that will cover ALL routes – including remote and networking connections; set this to disallow communication on Tor and I2P networks (so that if a trojan does gain entry, it cannot communicate and execute), block unauthorized port use. 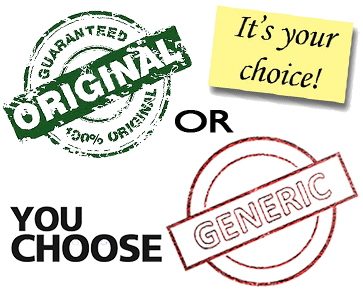 Get the best security software possible that will carry out in-depth scans. For good measure, make backups as regularly as possible to external storage. The next consideration is settings, or privilege. On a network of any size – family or business – do not use the Administrator log-in for general use, or stay logged-in for longer than necessary in this capacity. It’s safer to give the username/password to everyone who may need it with the instructions to log-off when a task is completed. Allow strictest Admin privileges that still enable the network to function (see the Microsoft website for more detail on this). The easiest element of prevention is good working practice – though perhaps this is sometimes the most difficult to enforce or adhere to. Bear in mind the delivery routes mentioned above. In the case of the e-mail delivery threat, depending on a system, set ‘mail to highest security. Ensure that all users are aware of the risks of opening unsolicited ‘mail. Disallow ActiveX (macro) function for all Microsoft Office applications. Find a method to filter incoming containing attachments and preview if neccessary by left-clicking and viewing Source in Properties which will supply the body of the text and display any hidden attachments without actually opening the file (DO NOT preview in Print Preview, as this can execute some malware). Stay organized and up-to-date – don’t let this current threat know your business! If you’ve lost valuable, irreplaceable data or need Data Recovery Plan for your Oraganisation or business— We can save it! Call us now at +254 711 051 000 or visit our offices Chiromo Court 3rd Floor Westlands, Kenya. Best of it, we have distributed offices all over East Africa and can easily get your device brought to us from anywhere in East Africa. Did you know that no organization looks forward to the day they implement their Data Disaster Recovery Plan. But like any good insurance policy, Data Disaster Recovery Plan is an essential component of business continuity and preservation. Am sure most people understand that much or have an idea. Where organizations often fall short, however, is the details and preparation. The only thing worse than having no plan at all is not going through the proper research and review prior to the event that takes you offline. 1 – Identify and plan for your most critical assets. Because of the high resource requirements of a good Data Disaster Recovery Plan, focus only on the processes and applications that are most crucial to your business while you restore normal operations. For many companies, those may be customer-facing applications and systems like e-commerce sites or portals. Applications like email, while important, may take a secondary position, and systems for internal use only – like HR or accounting applications – may fill out a third tier. The Recovery Point Objective (RPO) is the maximum amount of time your business can tolerate between data backups. If your RPO is one day, that means you can survive losing one day’s worth of data, but no more. Your Recovery Time Objective (RTO), on the other hand, is the target for restoring regular service after the disaster strikes. Neither metric is arbitrary, and you’ll likely have to crunch a lot of numbers and coordinate with virtually every business unit to determine the most accurate objectives. 3 – Scope out the technical mechanics. The hybrid era of IT, for all its benefits, only makes Data Disaster Recovery Plan planning more difficult. Critical business processes and applications exist in a complex web of interdependencies. You’ll have to map relationships across server, storage and network infrastructure and develop accurate scripts to ensure apps function like they’re supposed to in the recovery environment. 4 – Select an appropriate failover site. 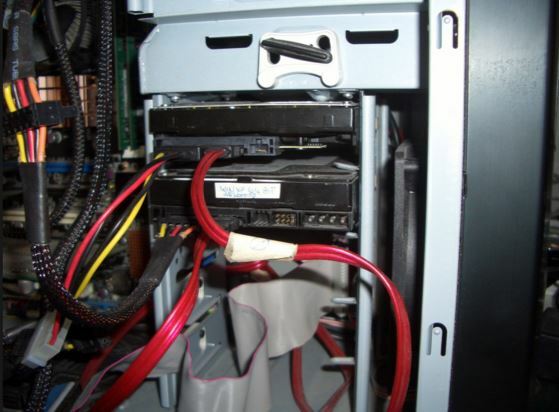 Traditional Data Disaster Recovery Plan requires redundant infrastructure in which to failover. Not only is this pricey, you have to choose a site that makes sense geographically (i.e. – low odds of being affected by same event) and offers an SLA that’s up to your current standards. 5 – Take advantage of the cloud. For many organizations, designing a robust Data Disaster Recovery Plan is significantly impeded due to extremely high cost and resource requirements. Data Disaster Recovery Plan as a Service (DRaaS), however, is a cloud-based solution that eliminates the heavy capital expense, putting Disaster Recovery within reach of companies unable to acquire the redundant infrastructure needed to restore service. EADH offers a comprehensive DRaaS solution for hosted private cloud customers that includes seamless failover and failback, an RPO within seconds, and an RTO within minutes. 6 – Document, Test, Refine. This is the hat trick of ensuring effective execution. Each of these components is critical. Your plan needs to be specific and detailed. Plans, procedures, responsibilities and check lists should be clearly documented. You want your team to have clear marching orders and leave little to interpretation in the middle of a crisis. 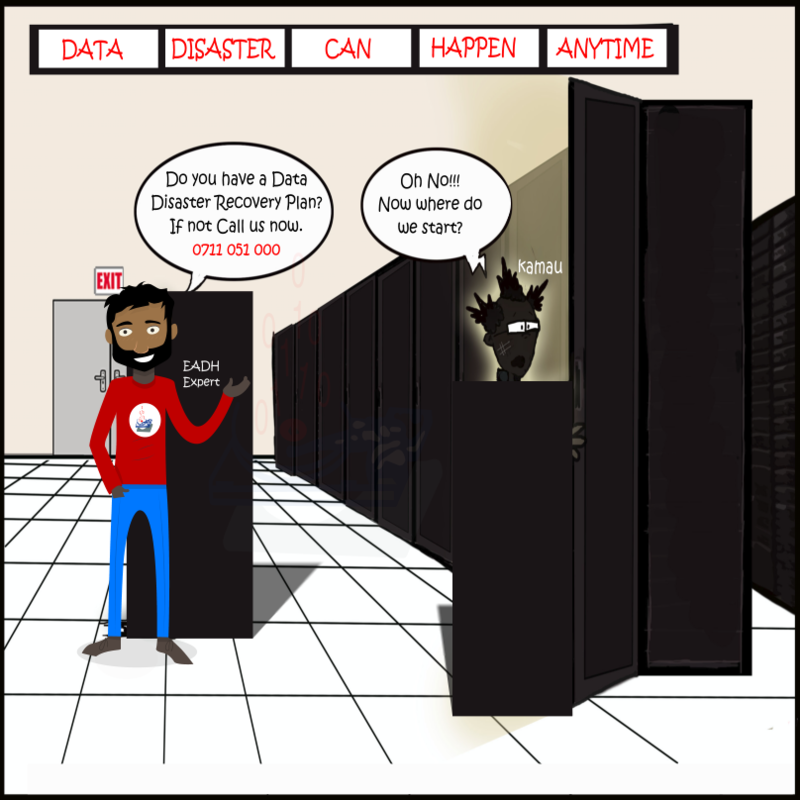 Call us now and dont be a victim of disaster like Kamau and you are hit when least expecting with a huge cost waiting for you only if he had a Data Disaster Recovery Plan. Computer can crash even when your browsing the internet, or to be more precise when your reading this article. Computer crashes come as a result of many reasons other been major or minor. What is affected as major component of the computer is the hard disk. Computer registry having errors can lead to a crash. The registry is like the nervous system of the system. It should be regularly cleaned using software like “registry clean up” and many other. This is to get rid of addresses of programs that were long time uninstalled and any to other unused registered scripts. The files get their way to the hard disc. Users who switch of systems directly from the start button pose there machine to greater chances of computer crashes. Crash is possible as the system sends processes to the CPU but suddenly power cut off, the process are left unattended creating errors. These errors are the cause of the crashes that happen every 15 minutes some where in the world. In this review there is a disconnection with the hard disc resulting to corrupt files if no precautions are taken. Software errors like installing the wrong drivers for a hardware device may lead to interrupted integration of the device leading to system halt. The computer stores its errors which are viewable through the event log. When errors pile up and little action is done the systems stands a chance to get a crash. Viruses cause file corruption, file damage. They also create files that duplicate themselves. If these viruses happen to enter the bios system, they can lead to computer crashes destruction to the hard disc sectors. What ever the case might be you’re always vulnerable to loss data once a crash occurs. Data recovery experts can help in recovering your data and fixing any form of damage that the device may have incurred. Many people are unaware of the importance of the hard drives to their PCs. The hard drive stores their most important information and it would be good to make sure that it is in good condition. The question posed then would be: How does one know when they have a bad hard drive? 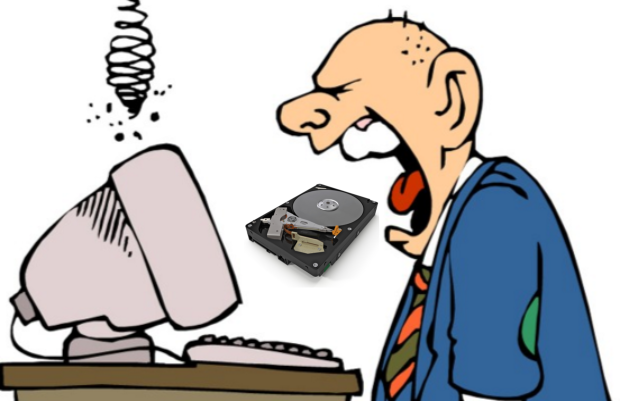 One sign of a bad hard drive is if your computer system keeps rebooting. When you startup your computer and during the boot process it restarts or reboots on its own then that is an indicator that you have a bad hard drive. This is mainly caused by the presence of viruses in the boot files i.e. the boot files have been corrupted in such a way that when they are executed by the system, they sequence of booting is repeated over and over again. The virus corrupts the boot files by causing them to form a loop and this is why the computer will keep rebooting. Another indication of a bad hard drive is when you experience many error messages. Some of the error messages you will experience are: ‘Missing Hard Drive’, ‘Operating System Missing’, ‘Hard Drive Failure’ and any other error message related to the hard drive. These error messages come about as a result of corruption of files in the hard drive, again caused by the presence of viruses. PC freezing is another indicator of bad hard drives. If your computer freezes often, then the hard drive could be having problems. Freezing mainly occurs when the system takes long or is unable to locate certain files that may be needed to carry out certain processing. As stated a number of times in this article, one of the causes of freezing is viruses. This is because once corruption of files occurs, when the system locates them, it will take long to interpret them. The other cause of freezing is lack of hard drive space. If your hard drive is overloaded with a lot of information, locating some files will take long and may lead the computer to freeze. If you find you are in this situation and are in fear that your data will be lost do not despair. In case you do not know what to do at all after you have lost the deleted files, DO NOT PANIC!! Panic is one of the greatest enemies of data recovery. In extreme cases, panic can cause company closure. This is how: if someone panics and begins telling everybody in the organization that data has been lost, word may leak out and clients may get to know about it and then the reputation of company will be spoilt. After data loss the best thing is to report to the relevant authorities like the ICT manager who should eventually consult a data recovery company so that they give the necessary guidance on how to try and retrieve your data before doing a whole lot of damage. They have the necessary skill and technology needed for recovering your data. Another thing you should never do after noticing that your data is missing is to run and install software. This can be very detrimental to your data because it may lead to permanent data loss. Since you don’t know what the specific problem is, do not install or even save any programs, files or software. Storing more information in a hard drive that is failing may cause overwriting of information on it and this is as good as permanently deleting your data. In relation to this, you should avoid running utility programs. If it is really necessary for you to do so then make sure you have an IT specialist with you because if you don’t run them correctly, you could lose your data permanently. Some of these utility programs are like scandisk, chckdisk and Norton disk doctor. They should be run with extreme caution. 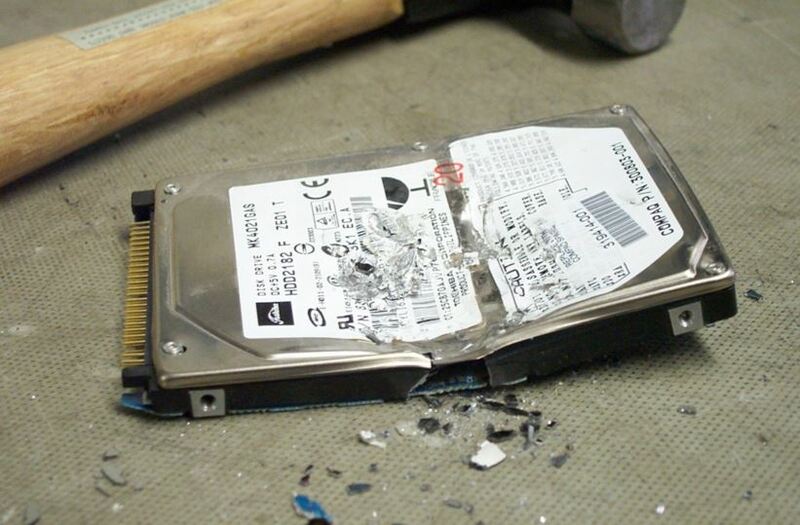 But if your hard drive has already failed you can get affordable data recovery services. Get to know the methods and technology being used to perform the recovery services. Making a visit to the premises where the recovery is done would be good so that you can see some of the tools, technology and software being used. You can be able to judge whether the technology is up-to-date or outdated. Some things you may ask are: Is the equipment being used a reflection current technology? What is the general environmental condition of the data recovery area? It would also be good to inquire on the methods to be used to recover data and some small explanation. This will help in making proper judgments about the company. It would be good to get some general procedures and background information on data recovery. Have one of the experts give a general explanation of the process. Most companies should give that description but there are some corporate secrets that they may never tell. Ask as many questions as possible to gauge the competency of the recovery experts. Having some insight on what takes place during the data recovery process may help one judge the competencies of a certain data recovery company. Also, check for qualifications. These qualifications include license certificates, certificates of operation and also tax compliant certificates. This helps in getting to know the genuineness of the company e.g. it would be good to know the minimum standards a company should have attained before having be fully declared as a data recovery company.